SUPERMAN ELSEWORLDS In this Elseworlds reality the space ship bearing little KAL-EL arrived on Earth splashing down in the ocean. His ship was equipped with a fail-safe device designed to compensate for the unexpected, such as the ship being forced off course and landing on a different planet than its intended destination. Once the ship was submerged in the ocean, the fail-safe activated automatically and did it's job, altering the infant's cellular structure just enough for him to be able to survive in this new environment. Basically, he's given the ability to breathe underwater. KAL-EL is discovered eventually in quite Moses-like manner, by the then queen of Poseidonis, adopted into her family and raised along side the most recent addition to the actual bloodline, ARTHUR. The two boys are raised as brothers. While ARTHUR is strong, and can speak with the sea creatures, KAL-EL is far stronger in many ways. He is still SUPERMAN, as he is in every incarnation, the alien who shows us what it is to be truly human. There is no questioning amongst the people when he assumes the mantel of AQUAMAN, protector of Poseidonis. ARTHUR remains ARTHUR. Poseidonis only has need of one champion. ARTHUR watches from the sidelines as KAL-EL battles versions of traditional AQUAMAN and SUPERMAN foes, his jealousy growing. The final straw is when KAL-EL beats out ARTHUR for the affections of MERA. He almost didn't even notice as KAL-EL is crowned king. Someone however did notice. Watching all these years from afar in his wizard's retreat, ATLAN is not happy. He despises KAL-EL for "popping" up and usurping the destiny he foresaw for his son. ATLAN stokes the fires of his son's jealousy, mixing truth with lie, and convinces ARTHUR to invoke an ancient right of ascension by combat. ARTHUR challenges KAL-EL to combat, winner take the throne. 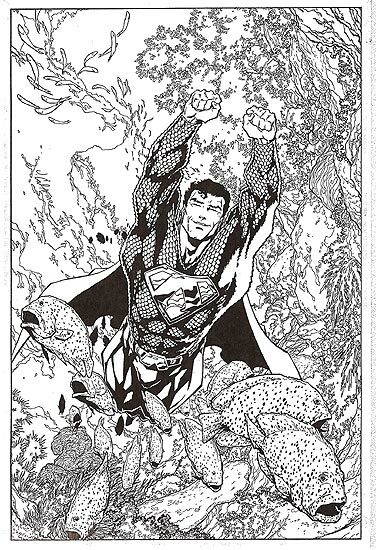 The fight is fierce, and while KAL-EL is obviously stronger, ARTHUR evens the odds by using his fish friends. Eventually, KAL-EL takes the upper hand and is about to claim victory.......when a sudden weakness overcomes him! ARTHUR seizes the opening and attacks ferociously. He pounds the reeling KAL-EL who seems unable to mount a defense. Finally, KAL-EL goes down, trapped under some rubble created by ORIN, who now stands above him ready to deliver the coup de grace. ARTHUR refuses. He's enraged with his father. He didn't want to win by cheating. It's not honorable. Defying his father, ARTHUR tries to remove the kryptonite from the battle field, but the blazing aura ATLAN placed around it is to intense. ATLAN gloats. KAL-EL is near death, and the rubble pinning him precludes moving him away from the kryptonite. ARTHUR curses his father. ATLAN gloats some more. Suddenly, ARTHUR plunges his hand (left hand) into the fiery shield, and screams at the intense pain as his flesh burns. But he refuses to give in, and before ATLAN can stop him, he reaches the kryptonite, wrenches it from the shield and hurls it from the battlefield. ARTHUR collapses, clutching his ruined hand. KAL-EL recovers his strength, frees himself and he and the injured ARTHUR attack together. KAL-EL ultimately defeats ATLAN, but the effort costs him his life. He dies in ARTHUR's arms. In the epilogue, we find that ORIN has become king, (having redeemed himself in the eyes of the Poseidonians), and we leave with him on the throne, thinking of how he'll spend his rule striving to live up to the memory of his dead step-brother, and contemplating the harpoon seated where his left hand used to be. Note: This was written when I was doing Aquaman, which is when he had a harpoon for his left hand.